Has the mystery of York’s headless Romans, which has puzzled archaeologists for over six years, finally been solved? In 2004, York Archaeological Trust excavated 80 burials in York in advance of housing developments. 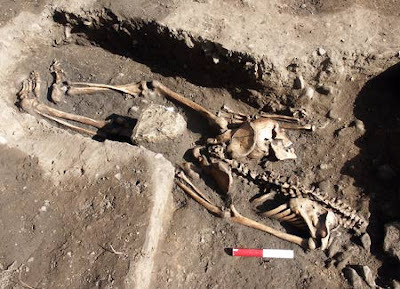 The burials are believed to be part of a large Roman cemetery on the outskirts of the town, dated to between the early 2nd century and late 3rd century. However, the burials do not fit in with the usual demographics for a Roman cemetery. They are mostly male and the majority are adults. The people also seem to have suffered harsh lifestyles and met violent deaths; nevertheless, they appear to have been carefully buried. There is evidence, for example, that funerary feasting took place at the cemetery. Were these people soldiers, criminals or gladiators? Were they from a group that had unusual religious beliefs or burial practices? On Monday, June 7th, archaeologists announced the results of the latest forensic tests carried out on more than 80 skeletons. They believe that the individuals may be gladiators and that the site may be the best preserved gladiator graveyard in the world. Scientists discovered a large carnivore bite mark, believed to have been inflicted by a lion, tiger or bear in the context of an arena. They also found some healed and unhealed weapon injuries, possible hammer blows to the head and a high incidence of substantial arm asymmetry. The development of much stronger muscles in the right arm is a feature that is notably mentioned in several works of ancient Roman literature in connection with gladiators. or members of a religious cult […]. carnivore bite mark, almost certainly sustained in an arena context […]. On Monday, a documentary entitled Gladiators: Back From The Dead, exploring the origins of the skeletons and following the lead theory that they were Roman gladiators will be shown on Channel 4 (9pm). York Archaeological Trust will also launch a website next week presenting all the various theories and asking members of the public to give their own opinions.